I think I have reached my limit as far as comprehending what I am doing or need to do. I am just frustrated so I am going to see if I can call an electrician that is used to working on this sort of thing. The Ooma support person also told me that even though I have cordless phones with caller ID (Uniden 1580 DECT 6.0), I will need to get a splitter and a caller ID box to get my calls displayed on my DIRECTV televisions again. I tell you, if I had known all of this and were aware that I'd have all these problems I might have just dealt with the pain I had from my previous provider. I really appreciate your help and your sense of humor! OK, I agree about Home Depot being closed on Easter and that's OK because you don't need to worry about corrosion for several months - well, hours if you lived in the Northest like I do. But I will feel like I have failed if you have to resort to an electrician to finish things up! First off, the phones you have are just like mine - same model but I bought the 5-handset package. You can get additional phones from many sources, or you could check out the price of the larger system to see if it makes more sense. Mine cost $80 from Staples during a sale. This one has a cord. This one plugs right into the wall. On either one, one jack is for the Telo, one for the cordless phone. The ooma tech was wrong about the caller ID box - your ooma will drive your DirectTV box just fine. Even the splitter is optional if you have another place to plug in the cordless base. Now about the phone jacks - nothing difficult here. 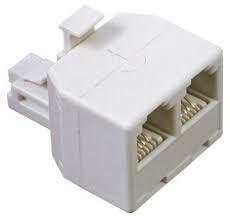 This picture shows the back of a typical wall jack. The connections you want to work with are the ones that come from the cable and attach to the screws. When I talk about red and green terminals I'm talking about the screws that are connected to wires on the jack itself. Remove the wires (probably white/blue) that are attached to those screw terminals and connect the ones that are now on the black and yellow screws. There is no voltage on the jack or wires, so it is completely safe. You can just wrap the white/blue ones around the cable to get them out of your way. Don't be confused by the fact that the cable shown uses red, green, black, and yellow wires - this is an older type of cable we call quad. Yours is probably the newer type that has the blue/white, orange/white, and green/white pairs. If nothing else you have definitely kept me laughing... I will have to go into each jack possibly tomorrow in between cooking dinner for Easter. So the wires that I replace with the orange / white wires will go where or do I just leaving the hanging? I sure hope this will work. As for the extensions, I will order them online. They are pretty cheap at $21 which as I think about it is more expensive than what I paid for the base and phone at Walmart which was $17. No biggie I guess. I think I have one of those phones splitters somewhere in this house. I will hunt that down as well. Thing is, I won't be able to really use it until all my jacks are working correct? ...and yes I sort of live in the Northeast...actually mid-Atlantic area. As always, will let you know how things turn out. Unfortunately it won't be tonight. Possibly tomorrow. kayembee wrote: If nothing else you have definitely kept me laughing... I will have to go into each jack possibly tomorrow in between cooking dinner for Easter. So the wires that I replace with the orange / white wires will go where or do I just leaving the hanging? I sure hope this will work. You can just wrap the extra wires around the cable in case you ever need them again. As for the extensions, I will order them online. They are pretty cheap at $21 which as I think about it is more expensive than what I paid for the base and phone at Walmart which was $17. No biggie I guess. I think I have one of those phones splitters somewhere in this house. I will hunt that down as well. Thing is, I won't be able to really use it until all my jacks are working correct? Right - but that will be Monday, right? We're in Washington at the bottom of the Puget Sound. Harstine Island, but it won't be on most maps. I hope you haven't had any flooding - the Northeast has had way more water than needed this year. I understand about cooking for Easter - we have a potluck for about 60 of our recovery folks tomorrow. This week we stuffed 90 plastic eggs with candy for an Easter egg hunt for the dozen or so kids. My wife and I made a pretty large pot of turkey veggie soup (about 25 servings) today between other chores like coloring eggs. We did tie-dye and spotted ones this year. I'd like to say they were for the kids but we really did it for ourselves and to give to some friends. Have a GREAT Easter! Well I finally was able to remove the phone jack back plate. The one I have looks nothing like the one you showed in the picture. So now I am lost. The one I have has clip like things instead of the screws that are shown in the picture. There are blue and white and orange and white wires. Not quite sure how to remove the wires from one row to the other. I also have a splitter so I am good to go from that standpoint. I guess if no one can help me with this I will have to call an electrician because I have been living with one phone since I have started using my OOMA and it is sort of a pain to have to carry it around from room to room. I also no longer have my calls displayed on my TV like I used to with my DIRECTV. I am hoping that once I get everything working again and all my wall jacks functional again, that I will have this feature again.